I finished reading Andy Crouch’s newest book, Strong and Weak: Embracing a Life of Love, Risk & True Flourishing, this weekend. I was telling my wife about it, and she asked why I had been interested in reading it. I said, “Um, because I read everything Andy Crouch writes?” While there are in fact many things Crouch has written that I have not read, I have been a fan of his ever since his days editing re:generation quarterly, a magazine of Christian cultural criticism, in the early aughts. He has published two previous books, Culture Making (a declaration that Christians ought to make culture, not just critique it), and Playing God (a declaration that power is not so bad after all, and can in fact bring about a lot of good), both of which I devoured. Strong and Weak is a bit different from those previous two books, though. The hardcover is a smaller format, for one thing, and so it is much shorter. For another thing, while the Amazon classification system put both Culture Making and Playing God into the “Social Issues” category, Strong and Weak is in the “Church Leadership” and “Self-Help” categories. While there are similarities, this book leans more toward leadership issues than cultural critique. Crouch begins the book by claiming that, to bring about true flourishing, it is necessary for us to have both authority and vulnerability, where authority is “the capacity for meanin gful action” (35) and vulnerability is “exposure to meaningful risk” (40). He places these on a 2×2 chart that he uses throughout the book. The combination of authority with vulnerability (quadrant I) leads to flourishing; having vulnerability without authority (quadrant II) leads to suffering; having neither authority nor vulnerability (quadrant III) leads to withdrawing; and having authority without vulnerability (quadrant IV) leads to exploiting. In the first part of the book, Crouch defines more fully each of the four quadrants. The second part of the book is devoted to setting out the path to flourishing, and is chiefly made up of two chapters: “Hidden Vulnerability” and “Descending to the Dead.” Both of these explore paradoxes related to getting into the upper right quadrant. In the first, he writes that “the most important thing we are called to do is help our communities meet their deepest vulnerability with appropriate authority—to help our communities live in the full authority and full vulnerability of Flourishing. And it turns out that in order to do that, we often must bear vulnerability that no one sees” (122). In the second, he writes that “the most transformative acts of our lives are likely to be the moments when we radically empty ourselves, in the very settings where we would normally be expected to exercise authority” (151). In other words, we get to flourishing by going through suffering. It was appropriate for me to read this book over Easter weekend, as I found it to be a valuable reflection on both the death and resurrection of Christ and his call for his followers to take up their crosses and follow him. This book was simple and profound, and I expect that it will stay with me for a long time as I seek to grow in leadership and help others to flourish. Edwin Friedman was a rabbi and family therapist whose writings on leadership, including the book Generation to Generation (written for congregational leaders), were shaped by family systems theory. A Failure of Nerve was intended to be his magnum opus on leadership, but he died in 1996 before he could complete it. · Friedman calls for decisiveness over data: He sees the accumulation of more and more data as debilitating, and urges that a decision needs to be made in situations where the same question asked to various experts stops bringing in new information. · Friedman calls for presence over technique: A lot of advice on leadership focuses on “how to”: move forward with a project, deal with problem situations/people, etc. 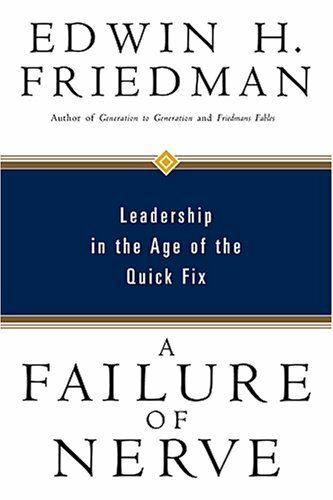 Friedman thinks the presence of a well-differentiated, non-anxious leader with integrity solves these kinds of problems better than a focus on technique. · Friedman calls for responsibility over empathy: He thinks above all, leaders need to take responsibility for their own emotional being and destiny. Rather than focusing on empathy, he argues that increasing one’s pain threshold for others helps them mature. This doesn’t mean completely ignoring other people; Friedman urges leaders to remain separate while being connected (in other words, in contact with others but not controlled by their emotions). I can at times be a bit of a contrarian myself, and so I enjoyed the contrarian nature of this book. There are some really good insights here that I’m still chewing on, like his idea that it isn’t the decision that matters so much as what you do after you make it (following through). Unfortunately, the book was completed after Friedman’s death, and at times it reads like it. There are five-star passages and two-star passages. There is more that I think could have been said: In particular, Friedman warns leaders about the danger of sabotage, but never really fleshes out what it looks like or why it happens. 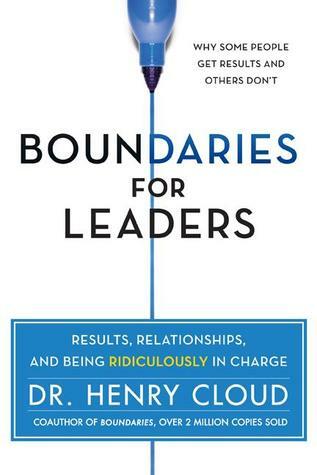 All in all, though, it is a worthwhile book on leadership that gives a lot of food for thought. We all know people who could best be described as “deep.” They know who they are; they live their lives with wisdom; they give good advice; they respond to life’s difficult situations in a way that most of us could only dream of. How do you become a deep person? If you’re a pastor, how do you cultivate deep people in your church? Gordon MacDonald sets out to answer these questions in the book Going Deep: Becoming a Person of Influence. He does not answer the questions directly, but instead explores them in a fictionalized format. He tells the story of himself and his wife Gail (the only real-life characters in the book) as they attempt to grow deep people in their church. Over the course of the book, they explore what it means to be deep, look at models of how to cultivate deep people, come up with a plan to cultivate depth in a small group in their church over the course of a year, and execute that plan, dealing with bumps and challenges along the way. I enjoyed the fictionalized format of the book (which MacDonald tried earlier in his book Who Stole My Church? ), and I appreciate that MacDonald decided to explore the concept of cultivating depth this way. It made the book easy to read, and I think it gives readers a tangible idea of what cultivating depth might look like and how long it might take that would be harder to pull off in a non-fiction format. My only criticism is that the story started off slowly. I was not really hooked until probably a third of the way through, which, in a 383-page book, is a long time. Early in the book, there was no conflict that I wanted to see resolved, and no mystery that I wanted to see solved. I think that MacDonald could have done a better job of hooking readers early by cutting down on introductory matters and getting into the action more quickly. In spite of the slow start, I’d recommend this book, especially to those pastors who are interested in growing deep people in their churches. Thanks to Thomas Nelson for a review copy of this book. I was not asked to give a positive review. Popular psychology books get a bad rap. So do business books. That means Henry Cloud’s Integrity: the Courage to Meet the Demands of Reality, which fits in both categories, is not supposed to be a good book. But it is. Early in the book, Cloud tells the story of a company he consulted for. The CEO didn’t know what to do about one of his employees. This employee was very profitable for the company, but he was very difficult to work with. He caused other good employees to leave, his presence was bad for company morale, and the CEO had to spend a lot of time dealing with the effects this employee had on others. Cloud then informed the CEO that every person has two aspects of the “wake” they leave behind them: the tasks and the relationships. If you only look at the tasks, you don’t see the whole picture. If you ignore someone’s character and only look at the “bottom line,” you’re blinding yourself to a huge chunk of reality. This eventually leads to failure, because character affects the bottom line in unforeseen ways. 1. Creates and maintains trust. 2. Is able to see and face reality. 3. Works in a way that brings results. 4. Embraces negative realities and solves them. 5. Causes growth and increase. 6. Achieves transcendence and meaning in life. One unfortunate part of the book (which came out in 2006) is that Cloud uses Tiger Woods as a positive example of someone with character. Woods, he says, was able to focus on growth in his golf game despite overwhelming success. He wasn’t satisfied with how he was playing, even when he was winning. Of course, the revelations about Woods’s private life only came out later. This book isn’t groundbreaking; it’s filled with a lot of common sense, but sometimes common sense isn’t all that common. I came away from it with a greater understanding of integrity and how it plays out in a work environment. It confirmed my suspicion that only caring about the bottom line can actually be harmful to the bottom line. Not only that, but it was a good challenge for me to grow in my own character. Seth Godin sells confidence, and there are plenty of people who are willing to buy. These are the only two books of Godin’s I have read, but by the time I read the second one I sensed that they were very similar. 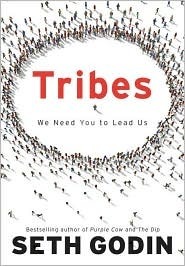 In Tribes, Godin’s goal is to get his readers to understand that there are people all over the world (“tribes”) with common interests who are waiting for a passionate person to lead them. The reader can be that passionate person. If the reader chooses not to be that passionate person, he or she is a “sheepwalker” — someone who is only interested in protecting the status quo. In Linchpin, Godin’s goal is to get his readers to understand that in the current work world, employees can only have job security if they make themselves indispensable. The reader can be that indispensable person, whom Godin calls a “linchpin.” If the reader chooses not to be a linchpin, he or she can fall prey to “the resistance,” or the “lizard brain.” The resistance is fearful and cautious, not wanting you to take risks because of the possibility of failure. If Seth Godin were a Christian (and I don’t think he is, despite the fact that he has spoken at Christian conferences), his spiritual gift would be Encouragement. He helps readers to realize that something needs doing, and helps them work up the gumption to do it. This review might seem dismissive of Godin’s writing, but it isn’t. I found both these books to be valuable and, yes, encouraging. Of the two, I’d recommend Linchpin. It was longer and went into more depth, though both it and Tribes had the same cheerleading tone. If you need a pep talk (and who doesn’t, from time to time? ), read Godin. Normally I write short reviews of every book I read grouped together by month. Since I’ve been busy lately, though, I haven’t done one of those monthly roundups since March. Now the prospect of writing several monthly roundups is becoming daunting, so I will try to post short reviews of each book as I have time to write them. When I was growing up in North Carolina, it was hard to not be aware of college basketball. There are a lot of great teams in the area, and people can be quite emotionally invested in their favorite teams. Though I did not have a personal connection to the University of North Carolina, I did root for their basketball team. A big part of the reason for that was my admiration for their long-time coach, Dean Smith. 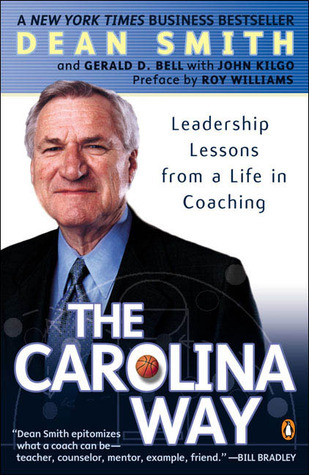 This book, which Smith wrote a few years after he retired in 1997, is his attempt to reflect on what he learned about leadership during his 36 years of coaching at UNC. Each chapter consists of Smith’s reflections on a particular topic (for example, “Why Unselfishness Works”), followed by reflections from some of Smith’s former players on that same topic. The players are usually ones who have spent time in the business world, and they talk about the influence Smith has had on the way they live and work. The chapter then closes with a reflection on that topic geared toward the realm of business written by Gerald Bell, a consultant and professor at UNC’s business school. What Smith taught his basketball teams boiled down to three main principles: play smart, play together, and play hard. He rarely talked about winning, he writes, because winning was out of his team’s control. He wanted his players to focus on execution, and the outcome would take care of itself. In reading this book, I learned a lot about Smith and what made him so successful. He has strong opinions, and they are part of what made the book entertaining. For example, he called tardiness “the height of arrogance,” because you are saying that your time is more important than someone else’s. I’d recommend this book to anyone with an interest in leadership, teaching or college basketball.